RSS Feed for keyword: "Moorish Architecture Pictures"
The year 1492 is primarily remembered for the first voyage of Christopher Columbus to find the New World, however it was also in 1492 control of the Kingdom of Granada, ruled by the Muslim Nasrid dynasty, was surrendered by Muhammad XII to Ferdinand and Isabella. This was the last stronghold of the Moors in Iberia, and the end of the Moorish style of architecture. Interesting Photo galleries related to "Moorish Architecture Pictures"
Over the years there were additions and alterations to the Great Mosque. In 1236, after Cordoba had been captured by the Christians it was converted into a church, and in the 16th century a cathedral was built where the mosque had been. Today La Mezquita is an intriguing mix of architectural design through the centuries. La Giralda, the bell tower of the Cathedral in Seville, was built in the 12th century as a minaret. Today, the Moorish architecture of the lower section is topped by both Gothic and Baroque additions, and the Almohad Mosque, the minaret served, became the site of the Cathedral, one of the world's largest churches. 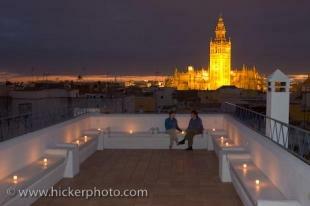 The Real Alcazar in Seville is a wonderful example of the versatility of the Moors architectural talent. Although the Muslim settlers started as invaders in the 8th century, by the time they were ousted in the 15th century these Moors had become an integral part of the history of Spain. Moorish architecture reflects the teachings of Mohammed and the Koran featuring design, calligraphy, geometric patterns and stucco work. The Mosques were not only places of worship, but also somewhere to learn reading, writing and general knowledge. The plain exterior of some of the Moorish domes can be deceiving, as the inside may be decorated with stone lattice work or intricate designs of multi-coloured mosaics. The original horseshoe shaped arch was the design used by the Visigoths, who inhabited Al Andalus at the time of the invasion by the Moors. Many of the first Moorish buildings continued with a similar design, such as the Caliphal arches at the Salon Rico in Medina Azahara. Then new styles began to appear - the Almohad Arch has a more intricate decorative style, and the Mudejar Arch is a more refined and simply decorated - excellent examples can be seen at Real Alcazar. Mudejar architecture using ceramics and brick, is the name given to the work done by Muslims who stayed after the Christians returned. 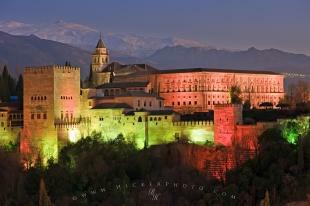 The Nasrid Dynasty was the last of the Moorish architects and the builders of the 'jewel' of Granada - the Alhambra. The Nasrid arches are decorative and elegant, as is the entire Alhambra. Using space, natural lighting and water features, the Alhambra was built near the end of the Muslim era in Spain. The construction of the Alhambra spread over the reigns of, three rulers, each adding their own touch. Many of the walls were decorated with faience mosaic in star patterns, panels of marble, carved stucco and wood were all materials used throughout the palaces. In the great banquet hall, Sala de los Reyes, there are exquisite paintings on leather adorning the ceiling. Typical of Moorish Architecture, the Alhambra was built with basic materials but the artisans were true craftsmen, and their work can still be seen today. The Albaicin district in Granada was once home to many Moors, and their houses and gardens can be seen behind high walls. El Banuelo, built in the 11th century, is an excellent example of Moorish baths.